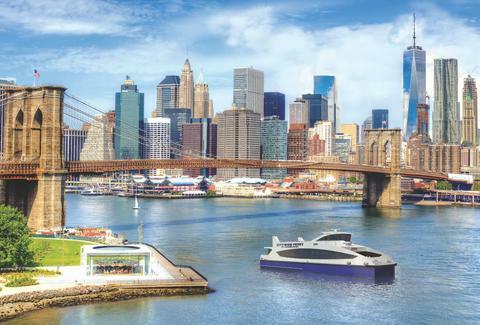 Getting around Brooklyn is about to get a whole lot easier when the NYC Ferry’s South Brooklyn route officially begins service on June 1. The route, which begins in Bay Ridge, includes stops at Brooklyn Army Terminal, Red Hook, Atlantic, and Dumbo before ending at Manhattan’s Pier 11 on Wall Street. The entire journey takes only 43 minutes, and at $2.75 a ride, is comparable to your standard MTA fare. Ferries are expected to run daily between 6:30am-10pm and include free transfer to other NYC Ferry routes, though subway and bus transfers are not available. In addition to the South Brooklyn route, two other lines are expected to begin service earlier, starting May 1: The Astoria Ferry, connecting Astoria and Lower Manhattan, and the Rockaway Route, which will transport passengers from Pier 11 to Rockaway in under an hour. Each ferry can hold 150 passengers and comes with on-ship Wi-Fi, but hopefully those harbor views actually make you want to put your phone down for once. Tanner Saunders is an Editorial Productions Assistant at Thrillist who really likes boats. Follow him on Instagram.